(Travel + Leisure) -- Staying at a hotel popular with celebrities means you could swim in the same pool as Kate Hudson once did or sleep in Madonna's favorite oceanfront suite. But imagine if you could actually live -- at least for a week or two -- in Mick Jagger's six-bedroom Caribbean retreat in Mustique. You could check out his personal photos, tool around in his Jeep, even use his can opener. Sure enough, if the Rolling Stones front man approves your application for the villa, Stargroves (potential renters must submit a bio, and the rocker personally vets each one), the Japanese-inspired casa Jagger -- which includes a cook, housekeeper, and gardener -- is yours. And Jagger is hardly the only celebrity handing over the keys to his kingdom to strangers. Increasingly, A-listers are offering their properties to anyone -- or at least, anyone who can afford the sometimes eye-popping cost. At Stargroves, the tab starts at $15,000 per week; others cost more than that per night. Why would a celebrity open his home to strangers? According to the experts, it's a very wise fiscal decision, and even heavy-hitters who aren't necessarily desperate for cash still want to break even. "As a graduate of the London School of Economics, Mick Jagger is an astute businessman," says Richard Klug of Beverly Hills, California-based Sotheby's International Realty, who works with high-profile clients. "He understands that leasing out the property when he's not there helps defray costs for the house." Klug also explains that stars, especially those in the music business, have been hard hit over the past five years due to dramatic changes in payment methods and royalty structures. The result: many of them are being forced to scale down, which means they're willing to give up the keys to their beachfront villas. Not that movie megastar Bruce Willis is lacking for cash, but he's nevertheless renting his Turks and Caicos compound, the Residence, where he married model Emma Heming. The oceanfront property has a five-bedroom main residence, two three-bedroom guest villas, a gigantic pool, and cool white furnishings. And the Willis family does vacation there. In fact, their volleyball games are pretty competitive. "I still have the scar on my knee from two Christmases ago," Heming told W magazine. You can even rent the abodes of stars who have passed on. Guests staying at Merv Griffin's 40-acre, 14-bedroom Palm Springs estate are encouraged to chat with the house staff, who worked with the star and love to share stories. They're also welcome to take Griffin's swan paddleboat for a spin on the property's lake, visit the racetrack and horses, or check out the photos of Griffin taken with various presidents. For stars who like the idea of renting their home but don't want guests snooping everywhere, Randy Travis has the ideal solution. At his Santa Fe property, which he rented until just recently, Travis kept the sacred office/gym -- where he wrote seven songs in two days -- off-limits to guests. How? The country singer said he put "police tape around that area." The Scoop: Jagger's six-bedroom Japanese-style beachfront villa is made up of six pavilions connected by elevated walkways that meander around the property's lush palm trees. There's an on-site tennis court, a large outdoor pool and hot tub, indoor and alfresco dining rooms, a game pavilion with a billiard table, and a housekeeper, gardener, and personal chef, all at your disposal. The best part? Spectacular views of the Caribbean. The Price: $15,000--$19,000 per week. The Scoop: Set on the grounds of the island's exclusive Parrot Cay resort, Willis's six-acre oceanfront compound has a five-bedroom main residence (with two detached guest suites) and two three-bedroom guest villas. Inside, you'll find whitewashed walls and teakwood furnishings, a glassed-in seating area, four-poster beds with mosquito netting, and a spacious deck with a 70-by-45-foot heated negative-edge swimming pool. The Price: $20,873 per night. The Scoop: Brinkley's home here is said to be just one of 18 of the star's properties (many of them in the Hamptons). The lushly landscaped estate lies on more than an acre of private beachfront land at Parrot Cay, the private island resort (Brinkley's remote villa is far removed from the hotel area and separated by a spit of land). There's a private shower off each of the three bedrooms, a giant veranda with a 45-by-16-foot heated pool, and no shortage of alfresco daybeds, teak chaise lounges, and umbrellas. 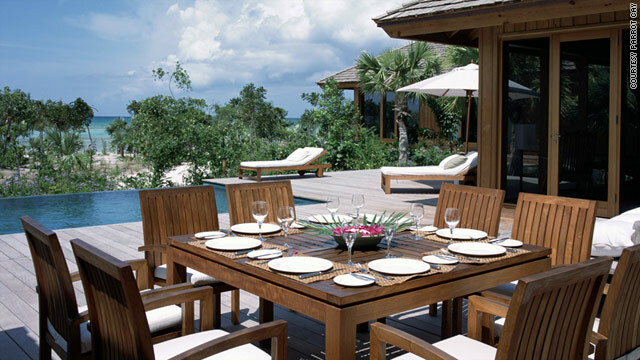 The villa comes with its own butler, and guests have access to a 13,000-square-foot open-air yoga studio and ayurvedic spa. The Price: $8,107 per night. The Scoop: Richards's estate is one of the multimillion-dollar private residences at Parrot Cay -- and it's his favorite place to relax. It lies on nearly two acres of beachfront property and has three bedrooms, all with ocean views and claw-foot bathtubs. There's a 60-inch rear projection television and DVD player set up in the living room, and outside, you'll find a heated, negative-edge swimming pool as well as a garden tiki hut that's perfect for massages. The Scoop: This 40-acre ranch estate and equestrian center looks almost exactly the same as when Griffin lived here, with photos of the star alongside musicians, actors, and presidents. There's a 2,000-square-foot living room with a retractable dome skylight, and the master bedroom comes with a custom-made, pop-up flat-screen TV, a Moroccan-tiled steam shower, and Griffin's beloved Boesendorfer grand piano. Surrounding the gated compound is a private lake filled with black bass, a saltwater infinity pool, a working horse ranch, and a racetrack. The Price: $6,000 per night. The Scoop: Powdery white-sand beaches and colorful coral reefs surround this 74-acre, private island retreat, which you and up to 27 guests can have all to yourselves. Perched on a hill overlooking the Caribbean, the Great House is a Balinese-style villa with eight rooms, each with a private balcony. Six more villas are scattered across the island, some built on the edge of a cliff, others set back against the greenery. The Price: $51,000 per night for up to 28 guests (includes all meals, drinks, and a staff of 60). The Scoop: The aviator's three-bedroom, three-bath home is divided into three levels and contains original fixtures, floor-to-ceiling windows, and a pool and cabana. Hughes himself installed some of the property's unique technology and quirky touches: lights, for instance, are turned on from floor-mounted foot panels, and the downstairs bathroom contains a long vanity with a built-in electric stovetop. The sprawling deck allows for 220-degree views of Palm Canyon Arroyo and Palm Springs. The Price: $400 per night. The Scoop: Aristotle Onassis purchased the 325-foot megayacht, the Christina O, in 1954 for a reported $34,000, then spent $4 million transforming the vessel into a luxury liner with 18 staterooms, a pool with a mosaic floor that morphs into a dance floor, a Renoir, and a grand spiral staircase with a silver and onyx handrail. You'll be ensconced in history as well: onboard, Onassis entertained Marilyn Monroe, Greta Garbo, Frank Sinatra, Sir Winston Churchill (who first met John F. Kennedy there in 1957 at Ari's bar), and many other notables (including his mistress Maria Callas and later wife Jacqueline Onassis). The Price: $65,000 to $94,000 per night. The Scoop: If size matters, look no further than Ted Turner's 591,000-acre Vermejo Park Ranch (it's two-thirds the size of Rhode Island). The property contains two main lodges (available April through November), but you can also choose to stay at Turner's intimate eight-bedroom Casa Grande (at least, when he's not there). Spend the afternoon fishing in one of the 21 trout-filled lakes or hunting for mule, deer, elk, and bison. Then end the day watching the wildlife from the ranch's sweeping veranda as the sun fades into the Sangre de Cristo mountain range. The Price: $650 per night.